Oh, wait. I must stop myself before I go into the whole Summer Reading Club spiel. It's that time again. Time for our visits to the local schools to pass out fliers and talk about the Summer Reading Club. To be honest, it's one of my favorite things to do! We go to all the elementary schools in our district, send fliers to the middle schools, and I've been scheduling our visits to local preschools as well. Now, when we go to the elementary schools we do the spiel. We tell them about the Summer Reading Club: how to join, what they have to do, what fabulous prizes they will earn. We also tell them about some of the cool programs we have going on this summer. But when we go to the preschools we do things a little bit differently. We start each visit with a story and then go into a brief spiel about the read-to-me club and a couple of the most appealing programs for preschoolers. So, my challenge is to find picture book readalouds appropriate for all preschool ages (generally from 2 to 5 or 6 years old) that tie in to our summer reading theme. Last year we did Get a Clue and we brought books that had to do with solving mysteries. This year I needed to find books about art. A couple of favorites jumped to mind, but I turned to the good people at PUBYAC for some more suggestions and, as usual, they did not let me down. I'd like to share a few of our favorite art-related books for preschoolers. 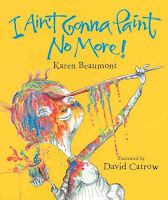 The first book that jumped to my mind was Karen Beaumont's fabulous I Ain't Gonna Paint No More! This catchy picture book can be sung (to the tune of It Ain't Gonna Rain No More) or read and the bright, silly pictures are a surefire hit with the preschool crowd. A boy gets caught painting up his house and vows not to paint anything else... but temptation gets the better of him and he just has to take some red and paint his... head. The rhyming verses encourage kids to guess which body part he will paint next. One teensy red flag is the use of the word "heck". I read this to a Methodist preschool class and one little boy whispered "It said a bad word, it said heck!" So... something to be aware of. Another hit with our older preschoolers has been Art by Patrick McDonnell. Art is the name of our main character here and Art loves to do art. He paints, draws, doodles, and even his blotches and squiggles all come together in a beautiful, colorful spread that elicits "Ooohs" and "Aaahs". And at the end, Art's art ends up on the refrigerator because mother loves A(a)rt. 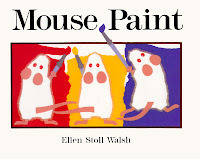 For the younger crowd, you really can't go wrong with Mouse Paint by Ellen Walsh. It starts with three white mice on a white piece of paper. Why are they on a white piece of paper? They're hiding from the cat, of course. Well, one day the three mice find three jars of paint. They think it is mouse paint. So they dive right in. This starts our colorful story as the mice discover what different colors they can make by combining red, yellow, and blue. This is a great, simple story for younger preschoolers and they can name the colors that come up on every page. I've yet to meet anyone who is not a fan of Mouse Paint. 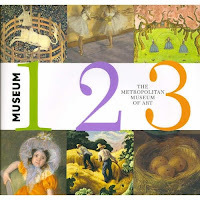 Museum 1 2 3 by the Metropolitan Museum of Art has a really cool way for little kids to look at art. 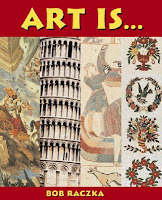 It goes through the numbers 1-10 and invites readers to count objects in art. Although the book is a little small for group readalouds, it would be a great book to peruse one on one. It's an interesting way to expose kids to art. Kids will love to search the pictures to find the objects. One of the books that jumped immediately to mind is a personal favorite of mine: Micawber by John Lithgow. Upon inspection, this book seemed a little too much for the preschool crowd, but I think it would work great with lower elementary kids. Micawber is a squirrel who loves to sneak into the art museum every day and watch the people copying the great masterpieces. One day he hitches a ride home with an unwitting artist and that night he borrows some of her paints to create his own masterpiece. Micawber continues painting until he has enough art to start his own animal art museum. I love the great rhyming text which has a really rich vocabulary and the sweet story with colorful pictures. I won't forget this one when we start up our elementary storytimes in the fall. Last, but certainly not least, I want to point out two new favorites that were suggested by PUBYAC members. Art Is and Artful Reading, both by Bob Raczka. 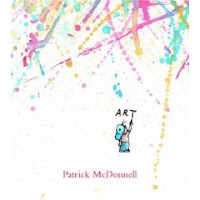 In Art Is, Raczka takes famous words of art and creates a rhyming text that points out all the different forms art can take. The rhyming text is simple enough to use with younger kids and Raczka includes additional information about each piece, making the book appealing to older readers as well. In Artful Reading, Raczka has collected art that features readers, again with a rhyming text that presents the art in an interesting way. These wonderful art-related books are helping us kick off what is sure to be a very colorful summer at the library!